Media captionChina's first operational aircraft carrier, the Liaoning, leaves mainland China for the first time. China's first operational aircraft carrier, the Liaoning, has arrived in Hong Kong. It follows Xi Jinping's visit last week, his first as Chinese president. In 2014, Beijing said it would allow Hong Kong to elect its leader directly, but only from a list of pre-approved candidates. That led to mass protests - known as the umbrella movement - demanding universal suffrage. Mr Xi's visit to the city came amid tight police security. Following his departure on Saturday, thousands of people marched in an annual event calling for more democracy. 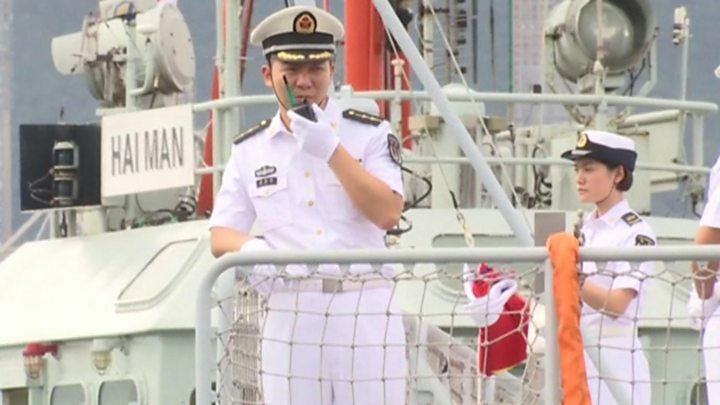 The Liaoning's presence has been viewed by some as a show of force by Beijing, but many in Hong Kong have also queued for free tickets to tour the ship. It is accompanied by three warships, and will be anchored near Hong Kong's Tsing Yi island for five days. The People's Liberation Army (PLA) has been stationed in Hong Kong since the 1997 handover. But it keeps an extremely low profile. PLA soldiers are very rarely, if ever, seen on the streets in uniform. That is why the very public visit of the Liaoning is so significant, just days after President Xi warned the city against independence forces. China watchers say its very presence is an unprecedented show of military force in rebellious Hong Kong. That it will be open to the public is an additional demonstration of China's soft power. The 300m (990ft) aircraft carrier is a refurbished Soviet ship of the Kuznetsov class purchased from Ukraine and was built in the late 1980s. It is part of a larger effort by Beijing to boost its military presence on the global stage. In April, China launched another aircraft carrier - its first to be made domestically. It is expected to be operational by 2020. China's military build-up comes amid rising tensions in the region. Beijing's territorial claims in the South China Sea are contested by several of its neighbours. The US regularly conducts what it calls freedom of navigation operations through the resource-rich waters to contest Beijing's claims. Tensions have also been heightened by North Korea's increasingly frequent missile and nuclear tests. On Tuesday North Korea claimed to have tested an intercontinental ballistic missile (ICBM) which some experts believe has the ability to reach Alaska.